Electronic medication administration record systems (eMARs) are workflow management systems that automate the inefficient and error-prone paper-based MAR process. Emar is standard practice for many acute care settings and is starting to be embraced by more innovative long-term care communities. With O-Meds© , nursing staff have an easy and efficient way to conduct daily med passes, ensuring that long-term care facilities meet the “five rights” of medication administration: right resident, right drug, right dose, right route of administration, and the right time. O-Meds© is easy to use and has a clear, crisp user interface. Nursing staff can easily use the program, with floor nurse training taking no more than a few minutes before the user can effectively and properly navigate the system. On the other hand, if the system is too complicated to use, directors of nursing or nurse managers will have difficulty enforcing compliance and ensuring that the system is being used properly…or at all. O-Meds focused on designing a system that was revolutionary in its simplicity. Because the system is entirely web-based and hosted by O-Meds, customers do not need to install or maintain any software on premise. Users simply log in and access the system through a web browser on any Windows or Apple computer. Fans of Apple iPads and Android tablets will be especially attracted to the system as it was designed with this popular new device in mind. O-Meds software, also the fastest iPad Emar, is completely web-based. While there is no silver bullet to improve everything in healthcare, technology does exist now to help nursing homes improve patient safety, reduce medication errors, and increase workflow efficiency. A successful eMAR deployment alone can help facilities redirect or save approximately $51,000 in annual labor costs that are currently wasted using paper-based MARs. In addition, more than 1,500 nursing hours can be redirected to resident care each year. Simply put innovations such as O-Meds© can improve medication pass efficiency and overall resident safety. 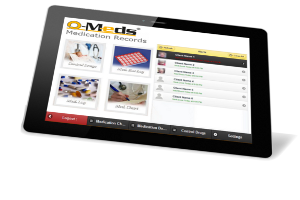 O-Meds© is a complete electronic health record that was designed to be both web-based and offer a touchscreen user interface. As a result, the product is highly differentiated and easy-to-use. O-Meds offers functionality for electronic signatures, charting, problem lists, medication management and document management. Among other capabilities. The system can also be configured to meet a provider’s personal charting preferences and custom forms can be implemented to work with O-Meds’ touch screen technology. O-Meds eMAR can be deployed standalone or in conjunction with system is HIPAA compliant. O-Meds© offers life time updates to ensure that it meets your needs and custom requirements. O-Meds updates are done on a monthly basis. We consider software updates as a high priority, because it provides us with better opportunities to serve you better and it saves you time. Backups are constantly being generated to ensure no data loss. Your data is hosted at a secure remote location. O-Meds© is accessible from any browser. Keep track of monthly medication changes. Add users and assign permissions. Enroll new patients and assign forms. Get rid of paper work!